Perma-Guard is the original and largest supplier of fresh water, food grade Diatomaceous Earth products for agricultural use in the world. Please note that Fossil Shell Flour® is almost white or slightly gray in color. We believe it to be the best quality available. 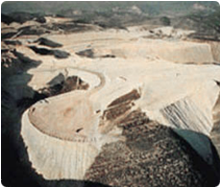 Perma-Guard, with more than 40 years of experience, is the company known world wide for using a grade and quality of Diatomaceous Earth that is extremely pure. It was important to have a consistent shape diatom and no unwanted sediment. The shape of the diatom must be tubular with holes on the walls. It must be fresh water because the diatoms form a harder shell and is less fragile that those in salt water. 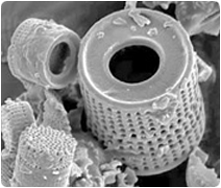 Salt water deposits contain a mix of diatom species. These deposits shapes and sediments are inconsistent making them unusable for our products. Perma-Guard, Inc. OMRI listed products are commonly used in sustainable agriculture. Perma-Guard is used by many certified organic growers and livestock, poultry and dairy operations and are also used in certified Organic grain and seed operations throughout the world. The OMRI listed Perma-Guard products certainly fill the bill for living a green, organic sustainable lifestyle whether you are in business or for your personal use at home. Perma-Guard products use Diatomaceous Earth, mother natures eco-friendly naturally organic material. Our products fit into the "Living Green" lifestyle. Actually, Diatomaceous Earth is not an earth. It is the fossilized remains of microscopic shells created by one celled plants called DIATOMS. Not all deposits of Diatomaceous Earth diatoms present in those deposits are the same. Perma-Guard's FOSSIL SHELL FLOUR® is a very pure form of Diatomaceous Earth used as an anti-caking feed additive.